GOAL! 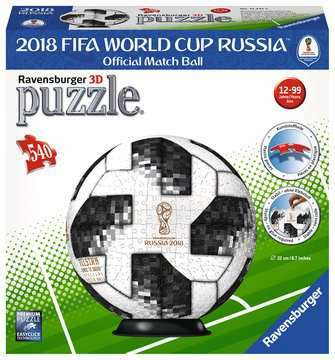 Kick back and enjoy the Fifa World Cup with this 3D Puzzleball from Ravensburger! Follow the numbered pieces or challenge yourself and follow the image to put together a life-sized soccer ball featuring artwork that resembles the soccer balls used in the 2018 FIFA World Cup hosted in Russia! 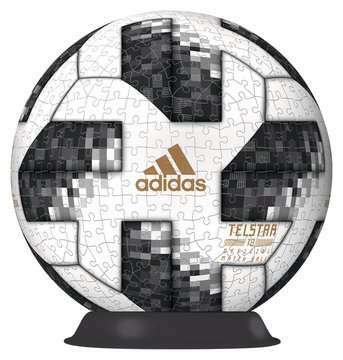 This design is a great collectors-item and is the perfect fit for any soccer enthusiast puzzler age 12 and up. Ravensburger’s 3D puzzle pieces are sturdy and interlock perfectly to create unique 3-dimensional shapes that stay together with no glue required. 10.75" x 7.5" x 2.75"